This fortified household is strong, intimidating, and remote—in short, everything an Orc holds dear. And if you get tired of the "remote" part, there's a convenient wayshrine just outside your gate! 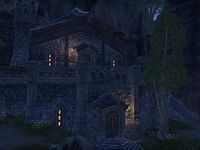 Mournoth Keep is a medium player house in northern Bangkorai.